Our experience will get you back on the road faster! Alberta Spring & Trailer Ltd is an Edmonton-based business specializing in truck & trailer parts, service, and commercial vehicle inspections (CVIP). 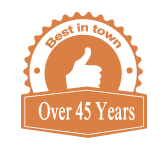 Our goal is get you on back on the road faster with our over 45 years of experience and old-fashion service. We can service any type of vehicle, and no fleet is too small. Alberta Spring & Trailer Ltd was started by Clarence and Johhny Wiersma who have been in the spring, trailer and suspension business for 45 years combined. We are very thankful for the customers who have supported is through the years. Clarence is now retired, we wish him well on his retirement. Johnny and all the staff are looking forward to serving our customers for a long time to come. Experienced and customer first spring, suspension, steering, and brake repair. We guarantee all of our truck and trailer auto parts with 1 year warranty. Alberta Spring & Trailer is now a certified inspection facility licensed by Alberta Transportation’s Vehicle Safety Division.